Women’s wigs serve myriad purposes. They could be purely aesthetic or to glam up, to do a special hairstyle for a particular occasion or just to have some fun. While there are more documented records of Victorian-era men donning wigs, especially royalty, lords, dukes, and noblemen, in little-known records women’s wigs have also found some notable presence. 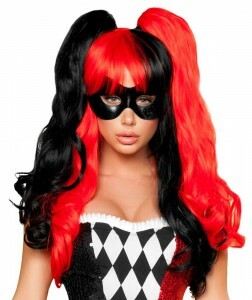 Modern women’s wigs can be purely a part of a costume. Some wigs are meant to make short hair look longer or just to facilitate a certain hairstyle. From Halloween costumes to themes parties, women’s wigs are integral to ever-changing fashion. Long curly or dead straight styles, hot pink to natural shades, blue to sultry red, women’s wig come in myriad forms, styles, colors and of course prices. You could be a blonde one day and a brunette on another, a redhead for one night and you could sport some dark rustic locks on another. Women’s wigs are fashionable, they could be worn for fun, with any costume, at parties or you could simply wear them to spice things up in your bedroom. The sheer versatility of women’s wigs available with us will ensure that you find the perfect match for any occasion you have in mind and your personal preferences.